La commare secca (literally "The skinny gossip", English title The Grim Reaper) is the 1962 Italian film written and directed by Bernardo Bertolucci, based on a story by Pier Paolo Pasolini. It was Bertolucci's directorial debut at age 21. The film was hailed by international critics as a success by a major new talent. 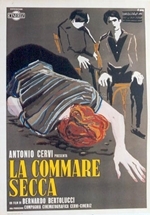 Many Italian critics thought it was very much a Pasolini film, although Bertolucci made a conscious effort to create a distinct individual style.